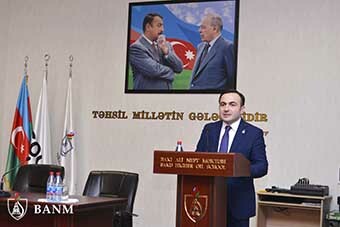 BP communications, external affairs, strategy and Azerbaijan, Georgia and Turkey region Vice president Bakhtiyar Aslanbayli conducted a long-awaited master class at Baku Higher Oil School (BHOS). The event gathered BHOS Rector Elmar Gasimov, Deputy Minister of Labor and Social Protection of Population of the Azerbaijan Republic Metin Kerimly, teachers and students of the Higher School. In the introductory speech to the master class, which was held under the title “Management, Leadership and Motivation”, the guest emphasized importance of an access to good education and said that BHOS created all conditions necessary for receiving high quality education. Then Bakhtiyar Aslanbayli spoke about planning as an important step after graduation from a higher educational institution, main stages of professional and personal development, assessment tools for career growth and benefits and specific features of horizontal and vertical promotion at work. The students received detailed information about leadership, professional and personal qualities necessary to work at a transnational company like BP, which are considered among the most important criteria for selection of candidates. The Vice president also touched upon an important issue of making timely and right choice when young people think of their education and profession. Then the guest answered questions by students who were very keen to learn more about successful professional and personal development. At the end of the master class, BHOS Rector Elmar Gasimov expressed his gratitude to BP communications, external affairs, strategy and AGT region Vice president and emphasized that the Higher School developed strong and effective partnership with the company. As part of this cooperation, Bakhtiyar Aslanbayli appointed a senior teacher at BHOS gives lessons to Petroleum Engineering and Chemical Engineering students.